The Times New Roman: MICHAEL Michael Kors "Grayson Large Satchel" vs Louis Vuitton "Speedy"
MICHAEL Michael Kors "Grayson Large Satchel" vs Louis Vuitton "Speedy"
One of my favorite colors in the world is cognac brown. When leather handbags are done in this color, it looks so rich and chic that I can't resist!﻿ I already have a few leather bags in this shade but it's my favorite. I certainly would make room for the Grayson satchel in my closet. Although I tend to stay away from brands like Coach and Michael Kors because it's so common, this bag speaks to me. I don't like to carry a handbag that every other girl and her cat will also be toting around town but this one is so classic. I would take the signature MK logo chain off to add a bit of mystery as to who the bag is actually designed by. 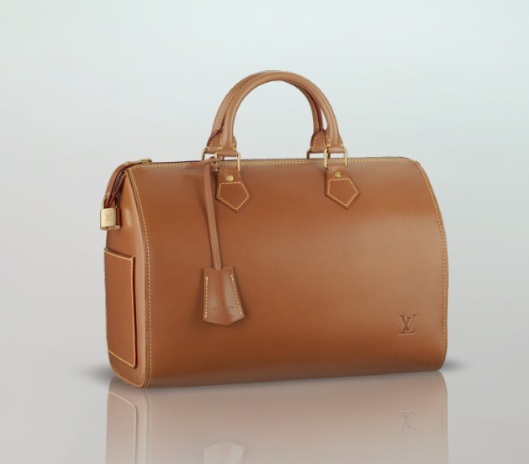 I think the Grayson satchel is a cost saving (and more unique) alternative to the Louis Vuitton Speedy (Nomade or Epi leather would be a good comparison; see picture below). I have a few older MICHAEL Michael Kors bags in my collection and although they are made in China, the leather and lining is actually very good quality. I'm not a fan of how Michael's newest bags are clearly "inspired" by iconic brands like Hermes, Chanel and Louis Vuitton (why can't he be original and make his own mark on the design world?) but at the same time, it's nice to have a similar look for less out there for those of us who want the style without the outrageous cost. I also like that the leather handles on the Grayson model will age beautifully. I think I might put it on my Christmas list! What a fantastic bag and it really is the perfect gift! It fits all your necessities perfectly!